If you are just wanting to do one day then enter the discount code of RWR55. 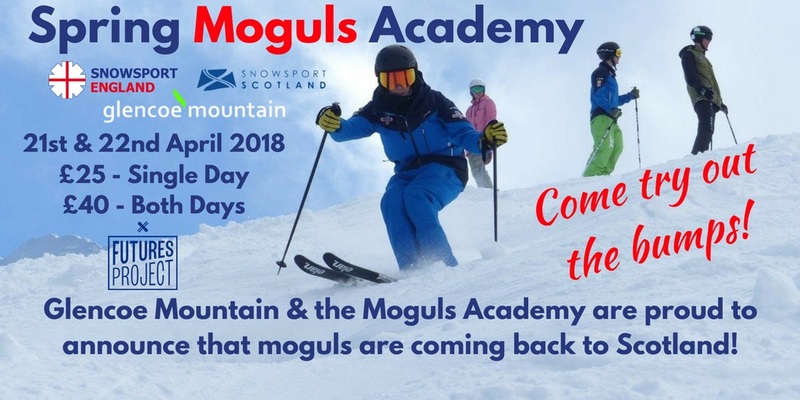 Glencoe Mountain and the UK Home Nations Mogul Academy are proud to announce that Moguls are coming back to Scotland! On the 21st and 22nd April 2018, we will be running a weekend of coaching sessions dedicated to Moguls and all things bumpy! With Glencoe’s fantastic spring snow conditions and sun……. its going to be fun! Coaching on both days for all levels will be facilitated by the UK Home Nations Moguls Academy Coaches. •To ensure we have the best environment for the sessions, a dedicated moguls training area is going to be constructed on the mountain which will cater to all levels of mogul skier – from those just starting out in moguls for the first time to those who love to compete in moguls. Numbers on the sessions will be limited so book now to secure your place. Lift passes will be required on each day and these can be purchased from the office at the base of the mountain and will be at a discounted rate for those booked onto the sessions. Glencoe Season pass holders will not be required to purchase lift passes for the sessions.